When it comes to construction companies, Sundt has a serious foothold in every arena, from mining and industrial to commercial, government, and health care contracts. 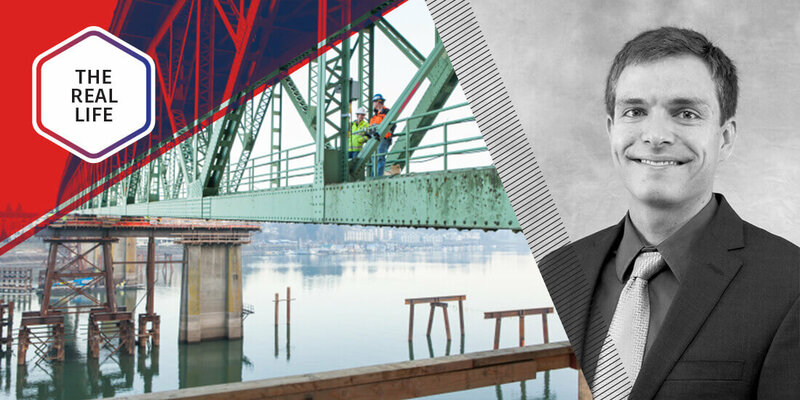 Working at such a large scale—and with the potential impacts of, say, something like a major bridge project—Sundt has recognized virtual construction as essential to increasing productivity and minimizing risk. A view of the completed Sellwood Bridge project. Courtesy Sundt. From an early age, he had been drawn to creating 3D models, but construction wasn’t Cylwik’s first choice for a career: It was video games. “I attended an industry event where animators and artists spoke about how much time they actually [spend] making these games, and I realized I wouldn’t be any better off doing that,” he says. “At the same time, qualifications-based selection was working its way through the Arizona market, and Sundt hired me to create 3D visuals for a project interview.” It was the best of both worlds. Here, Cylwik discusses his role at Sundt and how virtual engineering is changing the construction landscape. How much of your work is spent in the field? I spend about 20 percent of my time in the field. I’ve been very lucky that my role spans business development, preconstruction, and construction support. The business development usually starts in Sundt’s Tempe, Arizona, office. Then, during the final weeks, I’m with the presentation team buttoning up graphics and helping tell the story of how Sundt uses technology. Our preconstruction teams leverage model-based quantities, and all of that support happens in one of Sundt’s offices. While the operations modeling is completed in the office, a major piece is communicating with the team about the content in the model. The intent is that before Sundt breaks ground, we’ve created a geometrically accurate 3D model of the entire project. Nurturing the technology-centered culture shift within Sundt. Sundt has some of the best constructors in the industry, but their lifelong goal hasn’t been to learn new software every day. Some people embrace technology and squeeze every bit of value out of it while others fight it at every turn. Sundt is striving to have a consistent construction experience across all project teams, so when a new technology is implemented, it takes time to prove the value to everyone. There is definitely an art to helping project teams understand technology so they can successfully use it and realize its potential value. Conversely, what’s making your life easier these days? The Federal Highway Administration’s Every Day Counts, or EDC, initiatives have been a huge help to contractors. During round two of EDC, 3D modeling was selected as a primary focus. They developed training content and standards, coordinated peer exchanges, and held webinars and local conferences to discuss the advantages of 3D modeling for transportation projects. This effort has spurred on a very wide and deep adoption among state Departments of Transportation (DOTs). As DOTs have embraced the technology, their design consultants and construction contractors have all been faced with analyzing what 3D modeling could mean to their workflows. 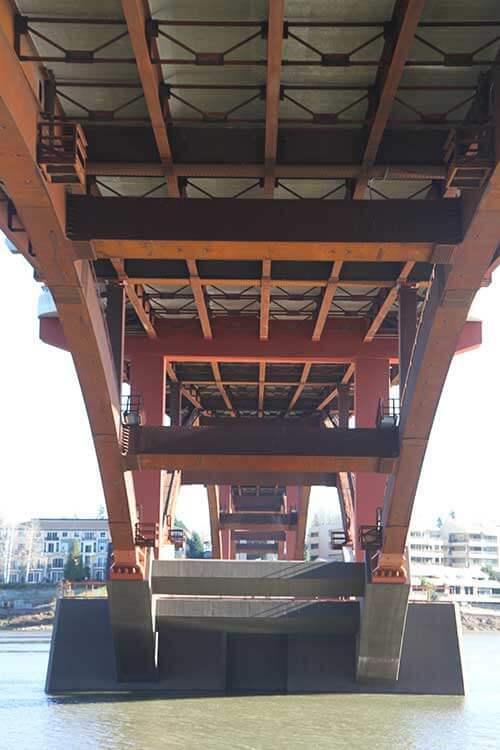 The underside of the completed Sellwood Bridge project. Courtesy Sundt. Can you give an example of how Sundt uses visuals to plan a project and communicate those plans to the community? 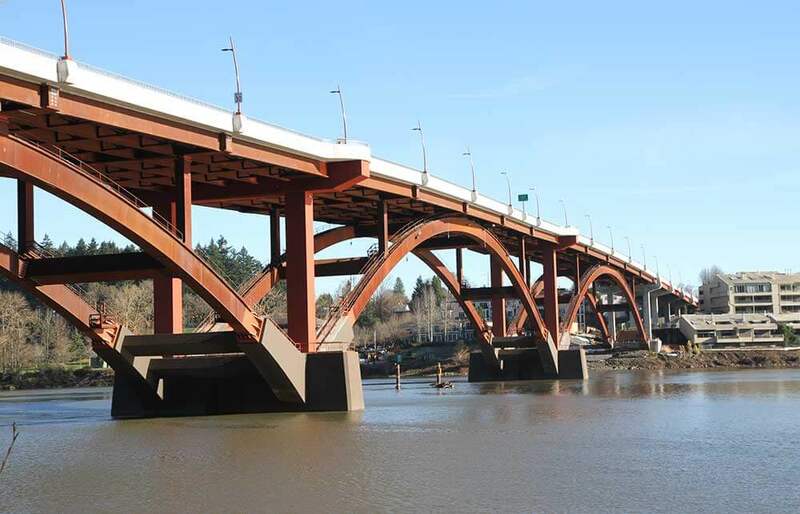 The Sellwood Bridge project in Portland, Oregon, is an excellent example. The Sellwood project used Autodesk AutoCAD Civil 3D, 3ds Max, Revit, and Navisworks Simulate. Using Civil 3D to model early concept drawings of the roadway, bridge, and site improvements, Sundt was able to correctly reproduce the design intent in an engineering-oriented environment. This means the model is geometrically accurate and located correctly in the world. This is key for telling the correct story to broad audiences. After modeling the proposed conditions in Civil 3D, Sundt had a subcontractor do a 3D laser scan of the entire bridge area. This laser scan easily references into the modeling environment, where Sundt used it as a shell to model the real-world conditions inside of 3ds Max and Revit. 3ds Max was used to model the site conditions—trees, general topography—and Revit was used to model the existing bridge structure. Once the models of the proposed and existing bridges were complete, both were imported to Navisworks. In Navisworks, Sundt linked the model components to schedule items from the project’s Primavera P6 schedule. This modeling process ties together advanced engineering capabilities with movie-quality visualization modeling and produces an animation based on real dates. Attempting to get to the final product any other way creates inefficiencies and assumptions that distract from the team’s message. What’s your take on how portable technology and mobile are impacting your job? Mobile technologies are enabling users to query BIMs for actionable information—information that informs them about a decision that needs to be made right now. For example, a pipe crew needs to decide whether they should finish their run two feet short of its final location so they can use parts they have on hand and stay on schedule or if they should wait until more parts arrive and fall behind schedule. They can now open a single mobile application, review that area for potential impacts of stopping their pipe run short, document their change, and communicate it to team members. Those kinds of decisions used to be made without much thought and definitely without documentation. This kind of workflow is a game changer for how the industry deals with the reality of large construction projects and trying to build a perfect environment on budget and on schedule.